One of the best shmups of recent time. It can be played in vertical full screen as well as on a horizontal screen. Highly recommended. I will try it tonight. Thanks for the tip! Not sure if anyone else is getting a malware alert from the Minionsoft site, but my Avast is alerting me anytime I visit this thread. DL'd several games from that site a while back with no problems. AVG doesn't flag this thread or that page. Is anyone else getting alerts? my Avast is alerting me anytime I visit this thread. Is there a specific page? I had to remove a couple pics in the driving cab examples thread because they were setting off avast. Sorry if this is causing red flags. Seems like everybody's on alert - for a JPG. Ugh. Edit: If I visit www.minionsoft.com, Avast tosses the whole site away. Hmm. Yup, if a mod or OP could save the pic and attach it to the post instead of linking, the problem will go away. My powers are limited to the driving cab forum. Good idea. Did it work? No alerts here! Good job! Getting back on topic! That Crimzon Clover: World Ignition game is fantastic! Thanks again for the suggestion! "Super win the game" - haven't played but I assume it's the same as the last. "The impossible game" - arrow keys for menu and configurable jump button. Anyone pick up any arcade friendly games in the Summer Steam sale? 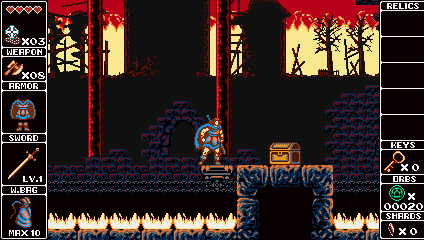 Odallus is a fantastic NES style game which has many similar points with Castlevania. Does it happen to have re-mappable inputs? Yes you can remap keyboard and gamepad inputs. No need of a mouse. The fantastic shmup, Eschatos, previously only available for owners of Japanese XBox 360s is now released on Steam: http://store.steampowered.com/app/378770/ I recommend getting the Wonder Pack, as you then also get Judgement Silversword too. Ten days from now, CAVEs beautiful shmup, Mushihimesama HD, previously only available for owners of Japanese XBox 360s, will appear on Steam too: http://store.steampowered.com/app/377860/ Let's hope enough people buy this so they continue to port the rest of their previously unreleased (home ports) games. Sure, many of their later games can be played in MAME now, but the emulation isn't very good, and this is an HD port. Would love to try these but Steam and I, not friends. copy-pasta from my build thread. DoDonPachi Resurrection $25.49 (15% off) launch sale. Revamped Gauntlet on the Steam Store? Looks nice....anyone tried it on an arcade cabinet? the "new" one? requires a controller, or at minimum WADS+other keys+Mouse ; not a good fit for arcade controls. now you have me curious since i've not seen it. the "Whitey" cabinet i have has a center giant trackball running as a mouse hack. too bad its to cold in the shop to fire it up and give it a go. !! Looking for After Burner Deluxe cabinet plastic parts ! !